So after a nice tasty pint of Gamma Ray at the (newly found by me) Duke’s Head beer house in Highgate Village, it was time to try these new beers pictured above. 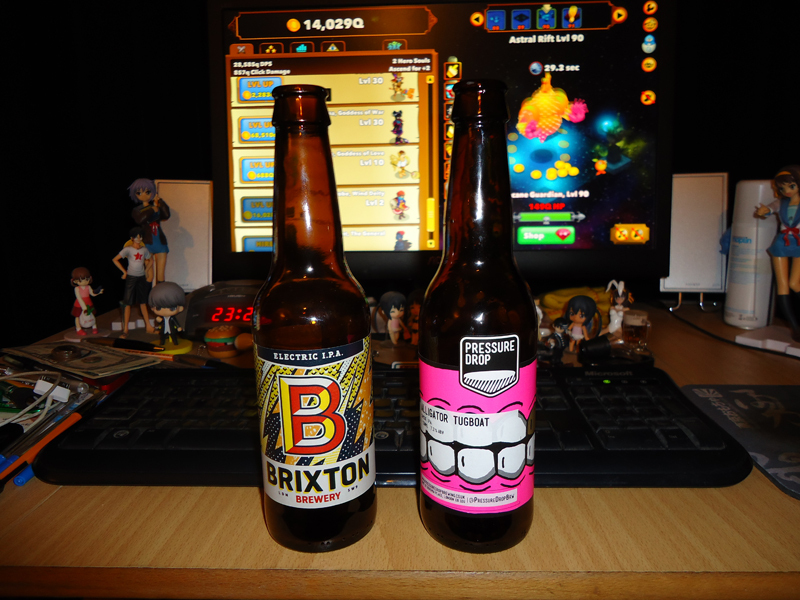 First up was Brixton Brewery’s Electric IPA. As I got further through the bottle, the one stand out flavour was the hopps. But not in a bad way. While I found it to be the strongest flavour, it didn’t kill the taste. The bottle mentions strong floral aromas which I didn’t pick up on. But I do have a rubbish sense of smell. Then on to Pressure Drop’s Alligator Tugboat, which has one of the best labels i’ve seen in a while. The clenched teech don’t quite come across in the above photo. I found this far harder to place any specific taste (I needed Scott for this one). It certainly had a darker and fuller taste than the Electric IPA. I toyed with the idea of coffee, but it didn’t seem right. Apart from not being able to identify any tastes, it was rather nice and packing a bit of a punch at 7.2%.